I am grateful to Dr John Murray for sending the abstract of the following study which suggests that wildcats with no recent input of feral cat genes still exist in isolated areas. The study does however suggest that this population of cats has interbred with feral cats in the distant past. 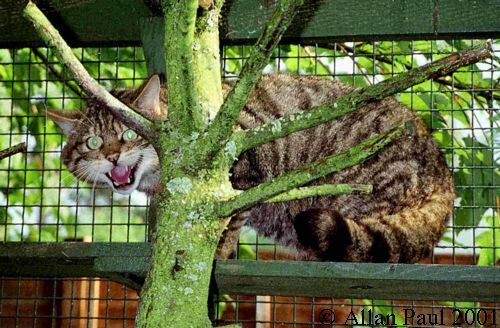 Genetic diversity and introgression in the Scottish wildcat. This paper describes a genetic analysis of wild-living cats in Scotland. Samples from 230 wild-living Scottish cats (including 13 museum skins) and 74 house cats from England and Scotland were surveyed for nine microsatellite loci. Pelage characteristics of the wild-living cats were recorded, and the cats were then grouped into five separate categories depending on the degree to which they conformed to the characteristics attributed to Felis silvestris Schreber, 1775. Allele frequency differences between the morphological groups are greater than those among the three house cat samples. Analysis of genetic distances suggests that more of the differences between individuals can be explained by pelage than geographical proximity, and that pelage and geographical location are not confounded. Ordination of the genetic distances suggests two main groups of wild-living cats, with intermediates, and one group is genetically very similar to the house cats, while the other group contains all cats taxonomically identified as wildcat based on morphology. A genetic mixture analysis gives similar results to the ordination, but also suggests that the genotypes of a sub-stantial number of cats in the wildcat group are drawn from a gene pool with genotypes in approximately equilibrium proportions. We argue that this is evidence that these cats do not have very recent domestic ancestry. However, from the morphological data it is highly likely that this gene pool also contains a contribution from earlier introgression of domestic cat genes. Molecular Ecology (2001) 10: 319-336.